Her comment got me thinking about those situations in my own life, when it would have been helpful to whisper a little advice to myself or give myself a glimpse of the bigger picture – what God was really doing in that time. The first that came to mind was the years my husband spent on the road. It came in waves – easy weeks that we both spent doing things we loved but still missing one another, the few weeks and days we spent together in new places, weeks that left us in tears, trials we both dealt with that the other couldn’t understand, trials that beat us against the rocks and left us with nothing to do but pray and cling to one another and God to keep from drowning. Then it would start all over again with easier goodbyes and easy weeks that flew by before a storm would blow in (sometimes literally), sending us crashing back into the sea of emotional exhaustion, hurts and sadness. As I look back on those earlier years, I am thankful for them. All of them. Not for the storms we walked through, but for what God used them for. Our faith in His provisions. The times my eyes were opened to the answers of prayers – even when the answer wasn’t yes. All of that gave me the empathy, little bits of wisdom, and ability to talk to and encourage other wives and mothers that are in similar situations with questions, worry, and fear. I’m realizing more and more lately how big that last one really is. I will not forget what He has done for us. However, I often forget that it shouldn’t be a secret I keep for myself. A few months ago in an online group for linewives, a woman asked if there were any happily married wives whose marriages had survived the stress and time apart required by the job. I was happy when many, many ladies replied with a big “YES!” but saddened that it took someone asking for us to speak up. For one reason or another, we all seemed to have forgotten to share the wonderful things God had done in our lives and marriages by allowing us to walk this path. I think that applies to all our lives though. We often get so caught up in what is happening to us and around us, we forget it really isn’t about us at all. It’s not just my story He created. it’s HIS story. When God saved Joseph from his brothers’ terrible plans, it wasn’t just to save Joseph. It was to save many lives. When He saves us and brings us to the other side of our trials, even in the midst of those, his intentions are the same: to save many lives for eternity. 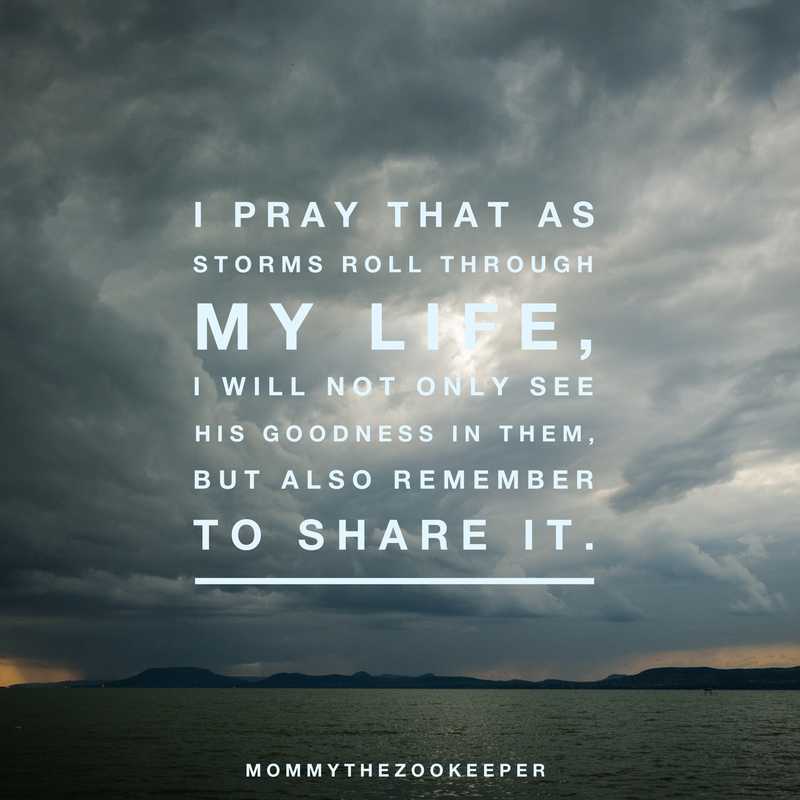 I pray that as storms roll through my life, I will not only see His goodness in them, but also remember to share it.